2004 Topps Wacky Packages Series 1 Original Sticker Card Art! Gravestones. 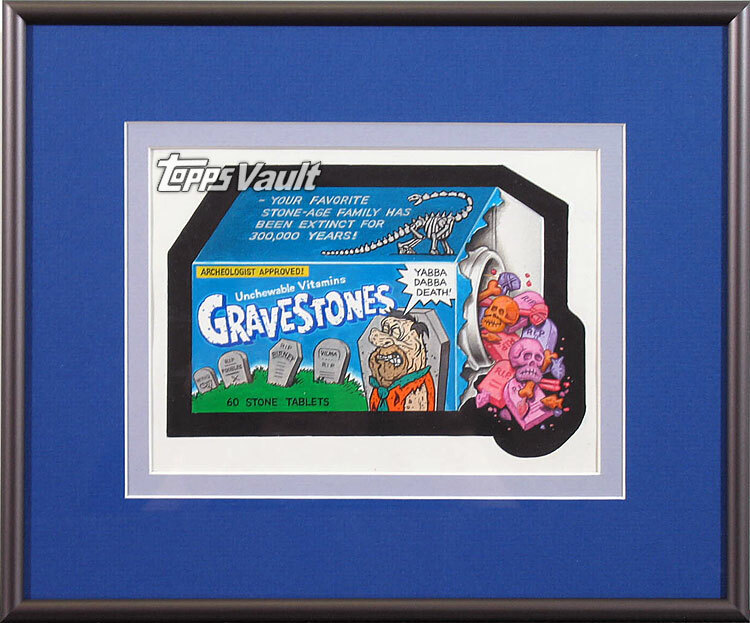 This exclusive eBay auction features the one-of-a-kind painting used in the process of creating this 2004 Topps Series 1 Wacky Packages Sticker. Topps commissioned artist John Pound to create this wacky rendition of the Flintstones Vitamins box. Mr. Pound actually created this work for Topps in 1992 but Topps did not use it until its 2004 ANS1 Wacky set. Art board measures approx. 6" X 9" and is in excellent-plus condition. This original painting comes professionally matted and framed (9" X 11") with your immediate viewing pleasure in mind. With its bright colors and sharp detail, this creative work is a must for the avid Wacky fan! All Topps Vault auction lots come with a certificate of authenticity. Collectors please visit our other exclusive sports and pop culture auctions on ebay today!